Lewis Hamilton had one of those very special weekends with a stunning qualifying session, pole position and a race, which he was able to completely dominate. He ends the weekend having closed the gap from 20 points to just 1 behind Sebastian Vettel. He was rightly criticized for being the only driver not to appear at the London Live promotion on Wednesday, but then he went out and dominated the Silverstone weekend, so his mini-break had achieved his objective in clearing his head of all the negatives around Baku and the Vettel penalty and the gearbox penalty he suffered in Austria. 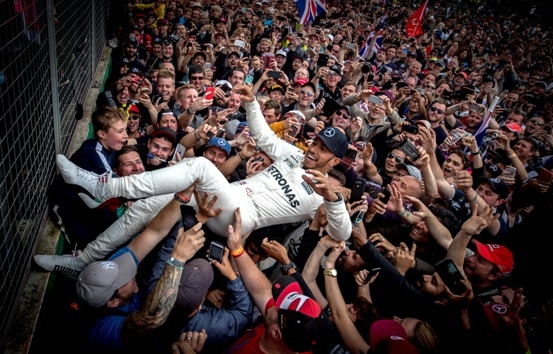 There was a lot of talk about his no-show at the London Live on Wednesday, but Hamilton knew what he needed to get ready for the British Grand Prix. My own view is that, if he was determined to go, he probably should have told his story a bit better before jetting off to a Greek island for a couple of days of R&R to manage expectations. Had he explained why he needed to miss the London promotional event before going people may have understood better. Although on balance I think that if he had his time again he probably would have grabbed a rest on Monday and Tuesday and appeared on Wednesday evening in London. But we are not privy to the other discussions going on at the moment between Liberty, Mercedes and all the star drivers about promotional days and what they need to do for F1 as a whole. There are some skirmishes going on behind the scenes, despite the hugely positive moves forward that the sport is taking under the new owners. Hamilton said after the race that “this is the best I have driven ever” and he certainly had a point to prove. All eyes are now on Ferrari to see how they react. Mercedes didn’t bring an upgrade to this race and they say that the new engine wasn’t worth much in terms of additional power. But it’s clear that they have developed slightly better than Ferrari in the last few weeks and more than that, they have understood the tyres better than at the start of the season. The two things together have given them a margin over Ferrari. However the next race in Hungary will be a strong race for Ferrari, a tighter race track and they have an upgrade coming for that race, as do Red Bull and Mercedes. The Mercedes long wheel base car was well suited to this Silverstone track and they made the most of it with a 1-2 finish, despite Bottas needing a five-place gearbox penalty. The race went wrong for Ferrari after both cars suffered front left tyre problems in the closing stages. Kimi Raikkonen had the second place bought and paid for after Max Verstappen got ahead of Vettel and held him up, which wrecked Vettel’s race. It also gave Raikkonen a big lead in second place. Bottas was trying to come through from 9th on the grid using a reverse strategy of soft tyres for the opening stint and supersoft for the second stint. He would not have caught Raikkonen without the tyre problems, which struck out of the blue with two laps to go. Many teams were in two minds about whether to do one pit stop or two, but it swung towards one stop after the supersofts turned out to suffer low degradation in the opening stint and they were able to go longer. Bottas managed to take his soft tyres to 36 laps of life, which is more than Ferrari did before hitting trouble. There were reports that Raikkonen hit some debris, but he said he did not. Red Bull’s Daniel Ricciardo did a superb job once again to finish in fifth place from the back of the grid, without a Safety Car (after the one in the opening few laps). He did it through a combination of good strategy and some fine overtakes. Although he blotted his record a little in the early stages when he undid all his good work at the start by running wide at Woodcote and being overtaken by the cars he had just passed. He was in a similar position to Valtteri Bottas in needing to offset himself against the cars ahead of him so he did a long first stint on supersoft tyres, which wasn’t easy to achieve at the pace he was going. And once he got onto the soft tyres, he was able to use the combination of the speed he could come out of the Maggots/ Becketts esses complex onto the Hangar straight and then being able to use DRS on the straight, to pass cars. For example when he passed Perez he was doing 320km/h while Perez was at 288km/h without DRS. That’s why he could pass the Force Indias, but they struggled to pass Magnussen for example.